In the last years ENEL (the Italian National Electric Power Authority) started a program for the installation of large heavy-duty gas turbines for electricity production. The high inlet gas temperatures needed to increase the efficiency of gas turbines cause severe corrosion / oxidation phenomena on their hot components, which are therefore protected with high-temperature coatings; the turbine blades refurbishment is largely dependent on the coating integrity and evolution with service. CISE and ENEL started a research program finalized to the study of a new electro-magnetic technique suitable for NDT on plasma-sprayed turbine blades (1). It relies on a dedicated hardware providing frequency-scanning eddy-current data, and on a model-based data interpretation; the model describes a plane electromagnetic wave interacting with a multi-layered conductor, each layer of which is characterized by a conductivity / permeability value and by a thickness. The inverse model applied to the experimental data gives the values of the layer parameters. The model-based data analysis allows calibration-free NDT; this is a key feature, as such a procedure is in principle easily applicable whenever a material can be modeled as a multi-layered conductor without the need of calibration samples. The technique has been applied to several NDT problems, relative to quality assurance and service damage evaluation; applications presented in this paper refer to: a) quality control of non-serviced MCrAlY coatings on Ni-base superalloys; b) service damage evaluation of MCrAlY coatings; c) TiCuIn anti-fretting coating thickness measurement on TiAlV blades. The coating thickness values are compared to optical microscopy measurements; for problem b) the aluminum -phase content of the coating is related to the ratio between its electrical conductivity and magnetic permeability (see figure). Results show the reliability of the technique as a wide-range NDT tool for metallic coatings. 1. G. Antonelli, M. Ruzzier, F. Necci, ASME Technical Paper 97-GT-001, presented at Turbo Expo '97, Orlando, FL, 2-6 June 1997; to be published in the ASME Transactions. CISE and ENEL have recently developed an electromagnetic non-destructive technique for the characterization of metallic coatings on metallic materials. This technique was initially finalized to the non-destructive measurement of MCrAlY coating thickness on Ni-base superalloys; nevertheless, it soon turned out to have a much wider range of applicability . 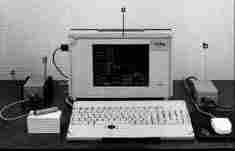 The technique relies on a model-based interpretation of frequency-scanning eddy-current data obtained by means of a proprietary hardware. The data are collected in the frequency range between 0.1 MHz and 10 MHz with maximum resolution of 1 kHz (§ 2), and are interpreted through a simple model of the interaction between the material (modelled as a multi-layered conductor) and the electromagnetic field generated by the probe (modelled as a plane electromagnetic wave) (§ 4). The mathematical inversion of the model provides information related to the electrical conductivity and the magnetic permeability profiles in the depth of the material; this information may be used to estimate parameters of diagnostic relevance. As the data interpretation is based on a model, the dependence of the measured data upon the diagnostic parameters is known; therefore the need of calibration pieces is removed. Only two reference homogeneous (i.e. without coating) samples are needed, in order to balance the instrument and to apply a normalization procedure to the data (§ 3); the samples are general-purpose ones, valid within very large NDT application classes, and do not need to be separately provided for each NDT application. As a consequence of the model-based data interpretation, C-THRU (Coating THickness measuRement Unit) may in principle be applied whenever the material can be modeled as a multi-layered conductor; moreover, special care has been used in designing the instrumentation to fit for use in power plants and in industrial environment. These two aspects allow application of C-THRU in a wide range of NDT problems: § 5 describes results obtained in the quality control of plasma-sprayed coating, while in § 6 results are shown which confirm the applicability of the technique in the evaluation of the residual life of serviced IN 738 blades coated with MCrAlY (AMDRY 995) coating. Analysis, display and storage of the results. In some applications a mechanical manipulator is needed in order to position the probe carefully on the sample. 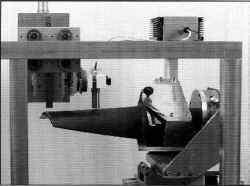 The portable manipulator presently in use, both for laboratory and in-shop application is shown in fig. 2; a more compact version is presently under development, to allow in-situ measurements on turbine blades. The eddy current unit provides excitation to the transmission coil of the probe, and the detection coil collects the electromagnetic field back-scattered by the material; the signal obtained is pre-amplified, balanced and again amplified after syncronous demodulation with respect to a reference signal provided by the instrument. The in-phase and quadrature components of the demodulated signal are digitalized with 12-bit resolution and sent to the PC via RS232. The data are finally stored in a file on the PC and subsequently read and handled by the analysis software. To single out the effects due to the material characteristics from the undesired influence of the other factors, a particular measurement procedure has been developed; this procedure relies on four frequency-scanning measurements, one performed on the component under inspection and the other three performed on two homogeneous reference samples A, B with electrical conductivities A, B different from each other but not too different from the conductivity of the component. The complete measurement procedure  is in most cases highly symplified, leading to typical practical procedures requiring a few seconds up to two minutes for each measurement point. The result of the measurement procedure and of the corresponding data processing is called normalized impedance; it gives a real number for each frequency value in the scan, and represents the input to the inversion algorithm whose output are the diagnostically relevant parameters. The normalized impedance model used for data interpretation describes the interaction between a plane electromagnetic wave and a multi-layered conductor ; each layer is characterized by a conductivity / permeability value and by a thickness. An error-function minimization algorithm gives an estimate of two parameters for each layer: the thickness of the layer and the ratio between the electrical conductivity and the magnetic permeability . If the material is known to be amagnetic, the first parameter corresponds to the electrical conductivity alone. The layer thickness is of direct diagnostic interest; the conductivity/permeability values may give indications about the coating evolution with service. Applications are described respectively in §§ 5 and 6.
evaluation of the versatility of the technique through the application on several different problems. Anti-fretting TiCuIn coating thickness measurement on TiAlV blades (§ 5.2). Three components utilized in the off-shore oil platforms have been considered: two flat samples (D2, D3) in austenitic-ferritic steel (DUPLEX) and a spherical valve (D1) in ferritic steel (F6). These components are coated with tungsten-carbide coating with Cr and/or Co added in an austenitic steel matrix; after coating deposition the components are ground, so that even if the coating process is well-characterized, some coating thickness disomogeneities may be induced by the mechanical finishing. An on-line non-destructive control would be useful to optimize the machining process. Tab. A shows the results relative to the non-destructive coating measurements on the flat samples: these measurements are compared with reference destructive measurements taken in the same positions. In this case, thanks to the large conductivity and permeability differences between the coating and the base material, no mechanical manipulator was required; moreover, the four frequency-scanning measurements prescribed by the standard measurement procedure could be reduced to two: one on the test sample and one on reference sample A, to correct for the (possible) probe temperature effects. Results relative to the third sample are shown in fig. 3. The sample is a ferritic steel (F6) sferical valve coated with a tungsten-carbide coating with Co added; measurements were taken along a circumference with the same measurement procedure as described above. Reference destructive mea-surements could not be performed on this sample, but the thickness values and the overall trend agree with FLAME-SPRAY expectations. The present paragraph reports measurements relative to a TiAlV blade used in the compression stage of a gas turbine. The root of the blade (fig. 4) is covered with an anti-fretting TiCuIn coating, whose thickness needs to be as uniform as possible to guarantee the maximum anti-fretting effect. Four sections, corres-ponding to two different blade roots, have been inspected; on two of them (samples T3, T4) a map of the coating thickness (fig. 5 shows the map relative to sample T3) has been obtained. On the other two (samples T5, T6) some reference destructive measurements have been taken, as reported in Tab. 2. The thickness values reported in fig. 5 meet the specifications for the component; the lower values found in the centre of the sample are in agreement with the fact that the root's surface is slightly convex in the central region, causing the final machining after coating deposition to have a stronger influence on the thickness of the coating. Tab. B compares the non-destructive measurements taken on samples T5 and T6 (ordered clockwise from point A in fig. 4) with reference destructive meas-urements taken in correspondence of the same points. The overall agreement is good; the 40 µm overestimate on point B is due to an inclusion within the coating, which can no longer be considered homogeneous. Indeed, the non-destructive estimate of the electrical conductivity in point B is lower than in the remaining points, indicating the presence of an anomaly. Results reported in Tab. 2 suggest the use of the conductivity estimate as an information to be combined with the coating thickness to get a more detailed description of the component under inspection. Fig. 4: TiAlV blade sections. Dots indicate non-destructive measurement points. Fig. 5: Coating thickness distribution on sample T3. T5-T6 (TiAlV blade root) coated with TiCuIn coating. Fig. 6: Measurement positions on the IN738 blade (concave side). Circles indicate non-destructive measurement positions, squares destructive ones. The hot components of gas turbines are generally protected with anti-corrosion/oxidation coatings. In the plasma-spray NiCoCrAlY coatings the protection is provided by the aluminum contained within the coating as a Ni-Al phase ( -phase), which combines with the oxigen present in the combusted gases thus preventing it damages to the base material. As the service goes on, the coating thickness is reduced, the aluminum is eliminated as an aluminum oxide scale and the nickel left forms a magnetic phase which causes the coating to become paramagnetic. The average magnetic permeability value of the coating is therefore related to its residual aluminum content, which in turn can be correlated to its residual life. the ratio /µ between the coating conductivity and the coating (relative) permeability µ. These two parameters have been successively compared to destructive measurements of both the coating thickness and the -phase content. Results are reported respectively in Fig. 7 and Fig. 8. Comparison of the data shows that a simultaneous determination of the coating thickness and of the -phase content is possible and reliable, thus providing a powerful tool for an NDT approach to the residual life evaluation of NiCoCrAlY coatings. Fig. 7: Comparison between destructive and non-destructive coating thickness measurements on the IN738 serviced blade. Fig. 8: Relation between the coating beta-phase content and the coating electrical conductivity / relative permeability ratio in the IN738 serviced blade. A new electro-magnetic technique designed for NDT on metallic coatings is described, along with laboratory and in-field applications. Thanks to a dedicated hardware and to a model-based data interpretation, it does not require the use of calibration pieces, and may be applied to a wide range of non-destructive problems. Results show the reliability of the technique as a quality-control tool for new and serviced components protected with metallic coatings. We are grateful to FLAME SPRAY for their support in the measurements described in § 5. G. Antonelli, M. Ruzzier, F. Necci: Thickness measurement of high-temperature MCrAlY coatings by frequency scanning eddy current technique. - To be published in the ASME Journal of Engineering For Gas Turbines and Power.Presented at the ASME Turbo Expo '97, June 2-6 1997, Orlando, Florida.